Eight countries identified as being the most affected by the illegal trade in elephant ivory have submitted national action plans to the United Nations-backed treaty for the conservation of endangered species containing measures to combat the scourge. The Secretariat of the Convention on International Trade in Endangered Species of Wild Fauna and Flora (CITES) received plans from China, Kenya, Malaysia, the Philippines, Thailand, Uganda, Tanzania and Viet Nam – identified as primary source, transit and import countries affected by the illegal trade in ivory. The plans – which contain specific activities in the areas of legislation and regulations, national and international enforcement, outreach and public awareness – were requested by the CITES Standing Committee as a response to the dramatic rise in the number of elephants poached for their ivory. Data gathered by CITES-led programme known as MIKE, or Monitoring Illegal Killing of Elephants, found that an estimated 17,000 elephants were illegally killed in 2011. Data for 2012 shows the situation did not improve, and actual figures for last year may be much higher. 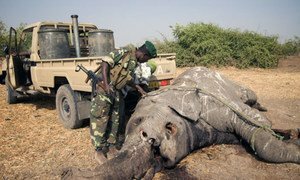 The illegal killing of large numbers of elephants for their ivory, according to CITES, is increasingly involving organized crime and, in some cases, well-armed rebel militias. Unknown amounts of poached ivory are believed to be exchanged for money, weapons and ammunition to support conflicts in several African countries. Significant poaching incidents have recently occurred in Cameroon (Bouba N’Djida National Park), the Democratic Republic of the Congo (Garamba National Park) and the Central African Republic (Dzanga-Ndoki National Park). The eight countries that have submitted action plans are requested to take urgent measures to put their plans into practice before July 2014, when the CITES Standing Committee will review their implementation, the Secretariat said in a news release. “Full implementation of the landmark decisions that CITES member States adopted by consensus last March to combat wildlife crime, together with the complementary decisions taken by the CITES Standing Committee, is key to winning the fight against illegal wildlife trade,” said John E. Scanlon, CITES Secretary-General. He added that the CITES Secretariat will continue to support member States in their efforts and to rally further political and financial support to assist them with on-the-ground implementation. In July 2014, the Secretariat will provide the Standing Committee with its evaluation of the activities conducted by each country, and recommend potential further measures to intensify efforts in critical areas. Two additional groups of countries that need to adopt measures in the near future have also been identified. The first group – comprising Cameroon, the Republic of Congo, the Democratic Republic of the Congo, Egypt, Ethiopia, Gabon, Mozambique and Nigeria – will need to develop and start implementing similar national action plans to combat illegal trade in ivory this year. Also, the Secretariat will be seeking clarification from Angola, Cambodia, Japan, Laos, Qatar and the United Arab Emirates on how they control trade in ivory. With 176 member States, CITES is one of the world’s most powerful tools for biodiversity conservation, regulating international trade in close to 35,000 species of plants and animals, including their products and derivatives, ensuring their survival in the wild with benefits for the livelihoods of local people and the global environment. The future of African elephants remains uncertain as illegal ivory trade continues to grow, according to a United Nations report released today, which calls for enhanced law enforcement to protect the majestic creatures and their environment.